Hear a vague rumor of a wizard named Velas who just moved into the area. Attempt to go to the Magic Shop in the Great Bazaar. Kill the wizard that attacks you, and get his key off his corpse. Go to the Velas Manor. Speak to Drathas Reyas in the Great Bazaar about the latest rumors, and he'll tell you of the wizard named Velas who has recently moved into the area. Apparently this wizard is supposed to try a display of power soon, but that's all you can get from Reyas. Leave the area and the next time you approach the Bazaar's Magic Shop, Ovis Velas will appear, make a brief speech, and attack you. Oddly, he is extremely easy to defeat (he is just level 1), leading you to believe that there's something more going on. Be sure to take the worn key from his corpse. Speak with Reyas again in order to trigger the next part of the story. 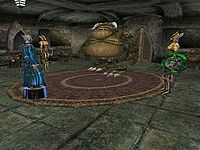 The key opens the Velas Manor in Godsreach where you encounter his brother Gavis Velas, another wizard who is more difficult to deal with because he summons several daedra to fight on his behalf (his minions include an ogrim titan, two golden saints and an occasionally summoned clannfear). Once you kill him, the quest ends. There's no real reward for this quest other than the loot from the corpses (Gavis carries on his person a Glass Jinkblade, a Flamemirror Robe, a Third Barrier Belt, a Ring of Poisonblooms, Exquisite Shoes, some money and a few health potions) and the satisfaction of defeating three or four daedra and a fairly powerful summoner at the same time, as well as the de facto possession of his manor. The two Golden Saints and the Ogrim Titan summoned by Gavis do not seem to be conventional summons and their corpses will stay after you defeat them. However, once you slay Gavis, all daedra (dead or alive) will vanish. If you do not want to fight the summons after the my unfortunate brother conversation, you'll note that Gavis himself is not attacking. You have an opportunity to attack him for a hit or two before he responds, and this may be sufficient to kill him outright, also dispelling the summons. If you pick the lock on Velas Manor and enter it before starting the quest, it will be empty and the quest will not trigger. The quest will still work if you pick the lock, do not enter the building yet, and then activate the quest. The bug is fixable by setting quest stage 20 in the Console. If you don't speak with Reyas after killing Ovis, Gavis will be in the manor but will not initiate a fight. However, you can still Frenzy or Taunt him till he attacks. You will receive the appropriate journal entry. 1 Today Ovis Velas magically appeared before me, announced he was going to put on a display of his power, then attacked me. Oddly enough, he went down far too easily, and scarcely harmed me. I wonder what this could mean. 10 Drathas Reyas has told me that there is a Velas Manor in Godsreach. The strange wizard I killed was named Velas. Perhaps I should go investigate. 20 I have discovered the true wizard of Dratha's rumors. The one I killed previously was only the brother of Gavis Velas, a very powerful summoner. He has challenged me to a duel, and it will take place immediately. 30 Finishes quest I have killed Gavis Velas and his summoned minions. May their scourge never threaten Mournhold again. This page was last modified on 24 October 2018, at 06:32.